It has been a productive stay at the "Rock Hall" drill site. The number and diversity of analyses performed on the drill target and drilled sample itself - mineralogy from CheMin, organics and volatiles from SAM, chemistry and spectral characteristics of the bedrock, drill tailings and excess drilled sample from APXS, ChemCam, and Mastcam - speak to the importance of samples we so painstakingly extract from Mars. After acquiring an image of the drill hole using MAHLI to pinpoint APXS's placement over the drill tailings the evening before, we depart for our next adventure - the clay-bearing unit. This unit, which lies between us and the next set of mesas further up Mount Sharp, exhibits a strong spectral signature of clay minerals from orbit. As clays are associated with the action of water and, typically, that of neutral pH waters, we are keen to learn about the nature and origins of the clays and the rocks that host them. Our first move is a series of bumps that will scoot us forward 2 m as we image the wheels that will carry us to the clay-bearing unit and beyond. The process, called full MAHLI wheel imaging, involves poising MAHLI obliquely above the wheels to image them, stowing the arm, bumping forward a few tens of centimeters to bring the next segment of wheel into view, unstowing the arm, and imaging the wheels once again. It takes 4 small bumps to fully image the outer circumference of the wheels. 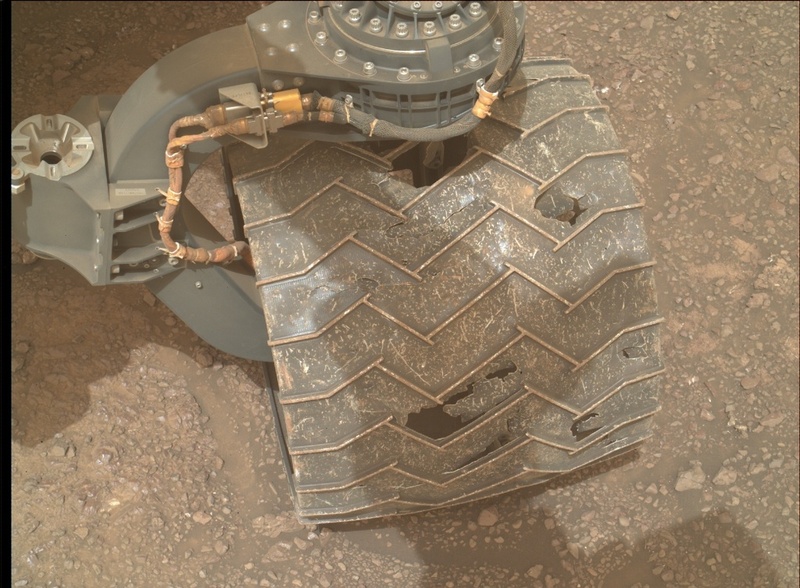 The first set of wheel images was acquired by MAHLI on Sol 2291, one of which is featured above. Even with the bumps and tears visible in this image, the wheels are still capable of carrying us for many more kilometers across the clay-bearing unit and up Mount Sharp! As we bump forward to take the wheel images, we will also acquire a MARDI image at each stop, resulting in a tightly overlapping set of MARDI images that can be combined to create a digital elevation model of the terrain under the rover. The final stop will place the Rock Hall drill hole in the MARDI field of view, giving MARDI our last look at Rock Hall. After we drive, we will image our first new workspace in about a month, acquire a ChemCam raster using the automated AEGIS targeting system, and acquire a host of Navcam and Mastcam images and movies to monitor changes in the atmosphere caused by the regional dust storm. Perhaps Curiosity will have another up-close-and-personal encounter with a dust devil!